The VC 4000 is an early 8-bit cartridge-based game console released in Germany in 1978 by Interton. The console is quite obscure outside Germany, but many software compatible systems can be found in many European countries (see 1292 Advanced Programmable Video System). It's unclear if Interton really made the VC 4000 from scratch or if they bought the rights and the design to produce it, as many other brands produced similar systems the following years. The VC-4000 and is powered by a Signetics 2650A CPU (same as the Arcadia 2001) and a Signetics 2636 Video Controller. The two controllers are composed of a 12-key keypad, 2 fire buttons and an analog joystick. On the control panel of the system, one can find an on/off switch and three buttons: RESET, SELECT and START. 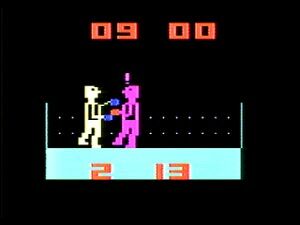 The 1292 Advanced Programmable Video System is a video game console released by European company Radofin in 1976. It is part of a group of software-compatible consoles which include the Interton VC-4000 and the Voltmace Database. The 1292 Advanced Programmable Video System included its power pack inside the console instead of an exterior power pack. Video: Audiovisual co-processor (video chipset, I/O Processor): Signetics 2636N at 3.58 MHz, addressing 32Kb of memory in 8Kb banks. This chipset was less powerful than the later model Signetics 2637N used in the Arcadia 2001. Is there anyone here who owns one of these early consoles? Another pair of consoles I've never seen before. The very first home console to come with an analogue controller as standard. Six years before Vectrex and Atari 5200 and twenty years before the Nintendo 64. Yet some Nintendo fanboys still try to claim the N64 had the first analogue controller! Not to mention that Sega also sold an analogue Mega Drive controller in Japan before the N64 controller and Sega's own 3D Controller for Saturn launched alongside NiGHTS Into Dreams. The AX-1E was manufacured by Micomsoft and I've seen it said that a version of it for PC Engine was released in Japan too. 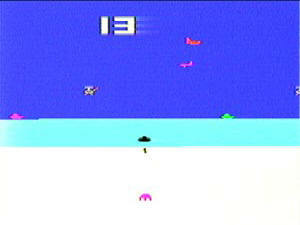 Highly impressive games there considering that the original iteration of the console predated even the Atari VCS/2600. Given how old the tech of this machine is, these games do not look bad at all. Click on the 'Models & Clones' tab to see some of the cool licensed versions that were sold throughout the world by various different companies. The 'Games & Emulation' and 'Other Media' tabs also have some cool pics to view. The likes of Activision made games for this console. The likes of Prize Fight and Air/Sea Attack look pretty cool, imho! If you look at the second link in my original post there is a list there too with countries of release for some of them too. Wow, another unknown to me.. Really interesting stuff indeed.